When I’m writing picture books, I strive for them to be lyrical and meaningful. When I’m writing middle-grade stories, I want them to be entertaining and empowering. The quiet connection. Kelly’s ears are always to the ground. 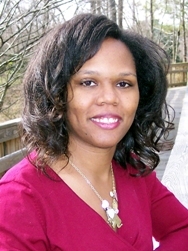 Resourceful, well-connected and informative, she’s our key go-to person when it comes to the goings on in the African American children’s literature community. * Inspired by my mentor at the Rutgers One-On-One Plus Conference (Thanks, Rotem :), I wrote my first rhyming picture book manuscript recently. It was a lot of fun. I definitely plan to write more. 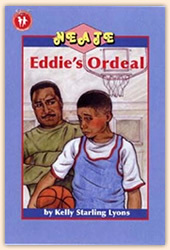 * At the launch party for NEATE: Eddie’s Ordeal, I was so nervous about reading in public that I had a boy play the part of Eddie rather than read the story myself. Amazingly, he stuttered just like I do sometimes. That young man, full of confidence and heart, inspired me to face my fears. Now, I love doing school and library visits and sharing my work at festivals. I’ve spoken to groups of all sizes. And the interesting part: I hardly ever stutter. When I do, I remind myself to let it go and keep it moving. * I can put things off big-time. Sometimes, pulling weeds is easier than writing. BIC is my new mantra :). * I have two forthcoming picture books with G. P. Putnam’s Sons. Both were inspired by family history and African-American history. * I grew up rarely seeing young people of color as main characters in children’s books. In fact, as a child, I read just one book by an African-American children’s book author — Roll of Thunder, Hear My Cry by Mildred D. Taylor. That’s why I feel so blessed to be part of The Brown Bookshelf. All kids need to see themselves in books. All kids need to know that they can be book creators. I write for children and the girl I used to be. 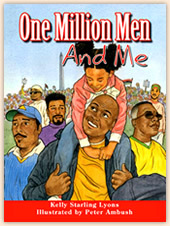 * My most special author moment was when my daughter asked me to read One Million Men and Me to her at bedtime. She’s heard it so many times. But she says it’s her favorite. It’s good to meet Kelly, and learn about her experiences as an author. I wonder–has she written anything anywhere about her experience publishing with a black-owned press? It’s been great working with Kelly on this initiative. She really does know her stuff, and when things get chaotic, she always has a thoughtful, diplomatic solution. Kelly is definitely a resourceful person who always keeps a cool head. It is a pleasure to work with her and count her as a friend and author mentor. Thanks for the love, everyone :). Being part of The Brown Bookshelf is a joy. Thanks Paula, Varian, Don and Carla for making our team so special. Zetta, I haven’t written anything specifically about publishing with Just Us Books. But I can tell you the Hudsons have been wonderful to me. With NEATE: Eddie’s Ordeal, they gave me my break in the field. They published my first PB, sent me to conferences, created beautiful posters of the cover, sponsored a youth writing contest to promote One Million Men and Me and give back. They’re great people. I’m blessed to have been published by them. At the risk of turning this into a lovefest (which is should be, no?) Kelly has a wonderful spirit. The community of children’s author, overall, is a very supportive and nurturing community. But even within that Kelly is special. I value our friendship and am so glad she agreed to come aboard for this project. I’m impressed with ANY author who manages to have kids and write! Thanks for the introduction. Thank you for making BBS a great resource. Go SU!!! Props to you for being one of 2009’s Brown Book Shelf featured authors. You’re doing a stellar job and may you continue to enthrall and inspire those around you with your words and confident personality! I met Kelly a few summers ago when we both attended Chautauqua. Since then, we’ve kept up an email friendship. I used One Million Men and Me in a creative writing class I taught to a group of 5th graders. They were very impressed with her work and I got cool points for knowing her personally.